Some delicious way to repurpose your maror. The seder is over. You’ve cried bitter tears over being enslaved in Egypt or more likely, cried bitter tears when grating and eating extra sharp horseradish. Now that you’ve gone to all that trouble, what does one actually do with the leftover horseradish? Admit it – most of the time it gets tossed. If you do have leftovers, then you might as well get some “double duty” out of your hard work and find some delicious ways to re-purpose. Once grated, the horseradish will lose some of its oomph after a few days (and with exposure to air), but not all and certainly not the great flavor behind its biting “kick.” Don’t let it go to waste! Store leftovers in a container for immediate use or freeze in small zip-top bags for the future (be sure to press air out before sealing!). Here are a few ideas to horse(-radish) around with either following Passover or all year round! Twice-baked potatoes – mix your hot, scooped-out potatoes with butter, sour cream, grated white cheddar and some grated horseradish. Season with salt and pepper and re-stuff into potato skins for a yummy dish. Don’t forget to garnish with minced chives. 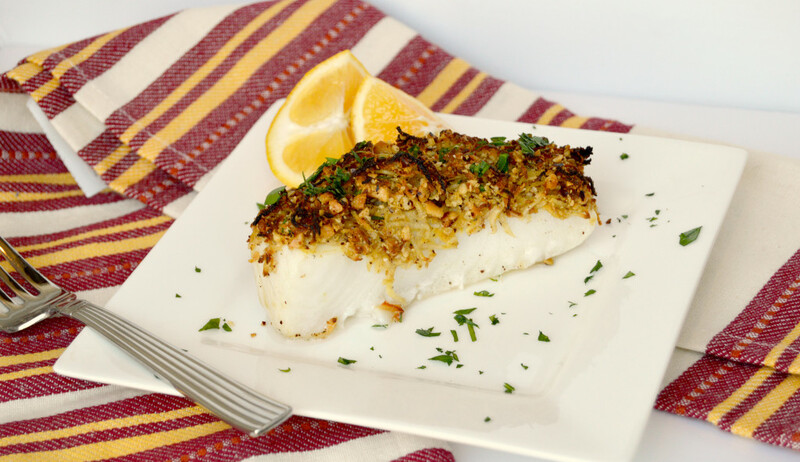 Crusted fish (see below for recipe) – Horseradish pairs beautifully with fish (that’s why we love it with gefilte fish!). Coarsely grated, it makes a fine crust that will adhere to your fish with oodles more flavor than breading. Horseradish Cream Sauce – grated horseradish can be added to sour cream or mayonnaise for your own homemade cold dip or accompaniment and can even be added to a hot cream sauce. Horseradish Gremolata – horseradish pairs well with beef as well (not just fish!). Finish a roast with a sprinkling of horseradish gremolata on top to boost flavor. Be sure to add at the end of cooking, as fresh horseradish loses it flavor when cooked for longer periods. In my home, beyond the horseradish we grate to eat as the bitter herb at our Seder, we also end up with the large root end of the horseradish that we display on our Seder plate. If you have leftover horseradish that was not yet grated, consider using it to make your own prepared horseradish (like Gold’s!). 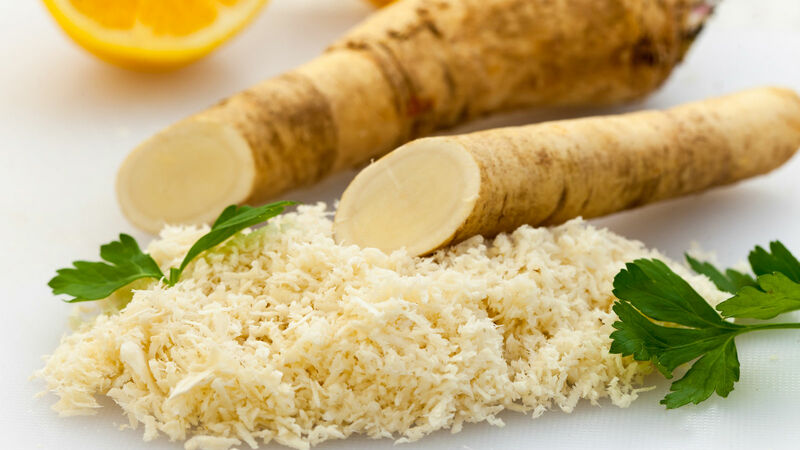 To make prepared horseradish, white vinegar and salt are added immediately following food processing/grating to temper the enzymatic reaction responsible for its bite and to stabilize the flavor. Lovers of super-hot horseradish might wait 3-4 minutes to add the vinegar in order to capture the stronger heat that is released (about 2 tablespoons vinegar and ½ teaspoon salt per cup of horseradish). Stored in a well-sealed jar or container, prepared horseradish will last for 4-6 weeks in the refrigerator. Just as we re-experience the redemption from bitter slavery at our Seder tables, redeem those horseradish leftovers in your kitchen…you’ll be glad you did. I developed the following recipe during the year to use up my supply of frozen horseradish. Note: According to Ashkenazic Jewish custom, mustard is not used during Passover. Rinse fillets and pat dry; place fillets on baking sheet. Season fillets liberally with a sprinkling of salt and pepper. Spread a thin layer of Dijon mustard over top of each fillet, about ½-¾ teaspoon of mustard per fillet. Combine horseradish and nuts together in a small bowl. 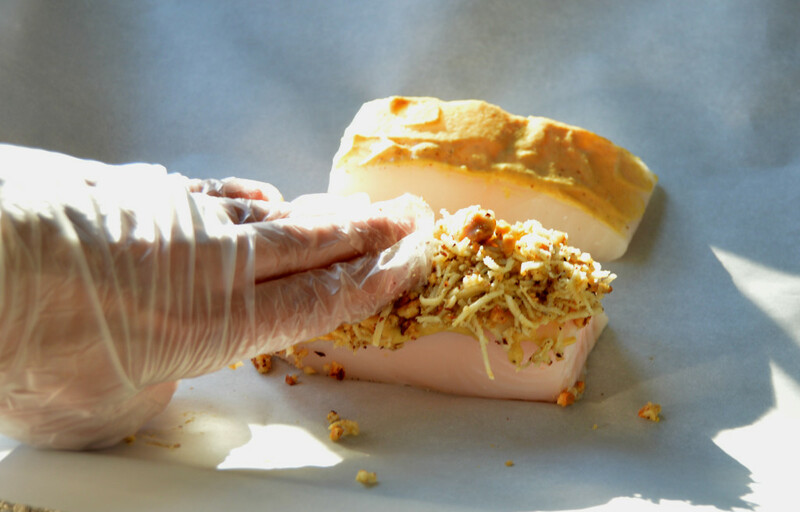 Add oil and toss until mixture is moistened. Mound a few tablespoons of the mixture on top of each fillet in an even layer. Place baking sheet on center rack in the oven and roast uncovered for 14-15 minutes depending on thickness. The crust should be golden and fish should appear completely opaque (from side view). Sprinkle fillets with minced fresh parsley and serve with lemon wedges. If you're left with a ton of potatoes post-Hanukkah, don't fret. Matzah Toppings from Around the World: 6 Ways! These open-face matzah sandwiches are inspired by the flavors of Italy, France, Thailand and more.